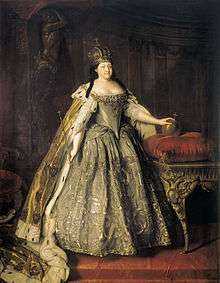 This is a list of all reigning monarchs in the history of Russia. 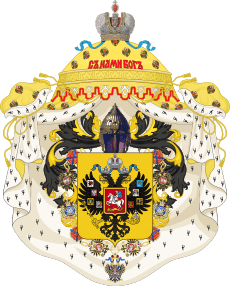 It includes titles Prince of Novgorod, Grand Prince of Kiev, Grand Prince of Vladimir, Grand Prince of Moscow, Tsar of All Rus', and Emperor of All Russia. 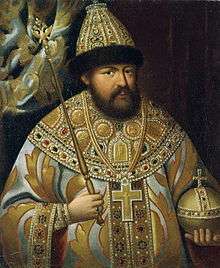 The list started with a semi-legendary Prince of Novgorod Rurik sometime in the mid 9th century (862) and ended with the Emperor of All Russia Nicholas II who abdicated in 1917, and was executed with his family in 1918. 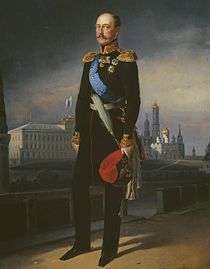 Emperor and Autocrat of all the Russias, of Moscow, Kiev, Vladimir, Novgorod, Tsar of Kazan, Tsar of Astrakhan, Tsar of Poland, Tsar of Siberia, Tsar of Chersonesos Taurica, Tsar of Georgia, Lord of Pskov, and Grand Duke of Smolensk, Lithuania, Volhynia, Podolia, and Finland, Prince of Estland, Livland, Courland and Semigalia, Samogitia, Belostok, Karelia, Tver, Yugra, Perm, Vyatka, Bulgaria and other territories; Lord and Grand Duke of Nizhny Novgorod, Sovereign of Chernigov, Ryazan, Polotsk, Rostov, Yaroslavl, Beloozero, Udoria, Obdoria, Kondia, Vitebsk, Mstislavl, and all northern territories; Sovereign of Iveria, Kartalinia, and the Kabardinian lands and Armenian territories – hereditary Lord and Ruler of the Circassians and Mountain Princes and others; Lord of Turkestan, Heir of Norway, Duke of Schleswig-Holstein, Stormarn, Dithmarschen, Oldenburg, and so forth, and so forth, and so forth. The land that is today known as Russia was populated by various East Slavic peoples from before the ninth century. The first states to exert hegemony over the region were those of the Rus' people, a branch of Nordic Varangians who moved into the region occupied by modern Russia sometime in the ninth century, and set up a series of states starting with the Rus' Khaganate sometime around 830 or so. 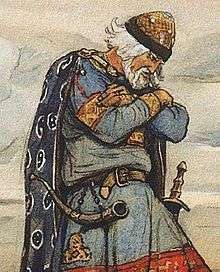 Little is known of the Rus' Khaganate beyond its existence, including the extent of its territory or any reliable list of its Khagans (rulers). 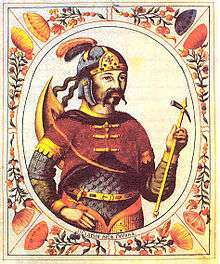 Traditionally, Russian statehood is traced to Rurik, a Rus' leader of Holmgard (later Novgorod, modern Veliky Novgorod), a different Rus' state. 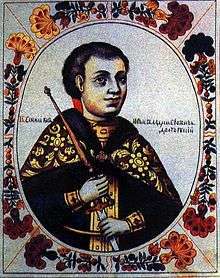 Rurik's successor Oleg moved his capital to Kiev, founding the state of Kievan Rus'. 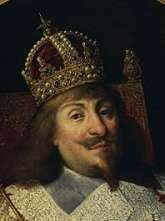 Over the next several centuries, the most important titles were those of the Grand Prince of Kiev and Grand Prince of Novgorod whose holder (often the same person) could claim hegemony. 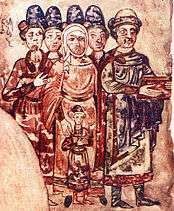 By the early 11th century, however, the Rus' state had fragmented into a series of petty principalities which warred constantly with each other. 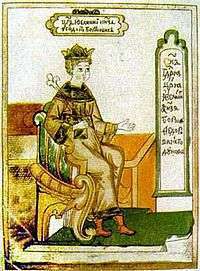 In 1097, the Council of Liubech formalized the federal nature of the Russian lands. 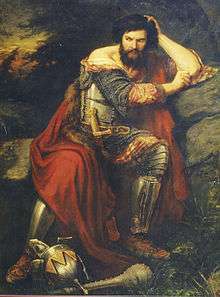 By the 12th century, the Grand Duchy of Vladimir became the dominant principality, adding its name to those of Novgorod and Kiev, culminating with the rule of Alexander Nevsky. After Alexander Nevsky, the region once again broke up into petty states, though the Grand Duchy of Moscow, founded by Alexander Nevsky's youngest son Daniel, began to consolidate control over the entire Russian territory in the 15th century. Following the Mongol conquests of the 13th century, all of the Russian principalities paid tribute to the Golden Horde, effectively operating as vassals of the Mongol state. 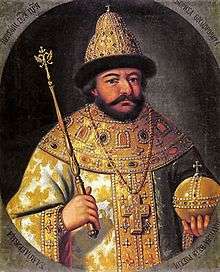 The Russians began to exert independence from the Mongols, culminating with Ivan the Great of Moscow ceasing tribute to the Horde, effectively declaring his independence. 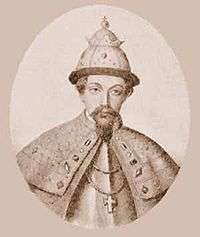 The last Grand Duke (sometimes Grand Prince) of Moscow Ivan the Terrible assumed the title Tsar of All Russias in 1547. 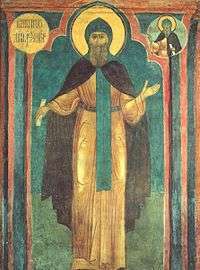 In 1169 Vladimir-Suzdal troops took Kiev. This act underlined the declining importance of that city. 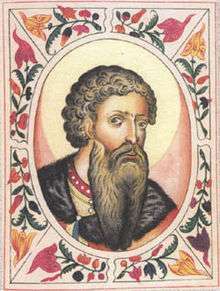 Alexander Nevsky, Grand Prince of Vladimir, placed his youngest son Daniel in charge of the territory around Moscow, and establishing the state of Muscovy, originally a vassal state to Vladimir-Suzdal. 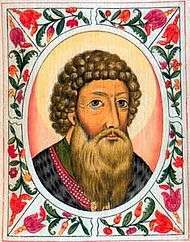 Daniel's son Ivan I assumed the title of Vladimir himself, establishing Muscovy as the premier principality among the various Russian states. 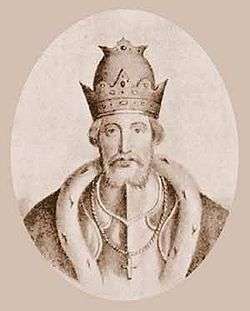 Later rulers of Muscovy would consolidate power, culminating with Ivan III who threw off the Mongol yoke and conquered most of the other Russian states. 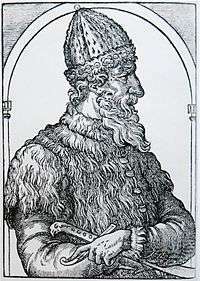 His son Vasili III completed the task of uniting all of Russia by eliminating the last few independent states in the 1520s. 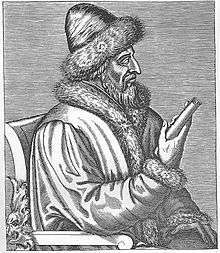 Vasili's son Ivan the Terrible formalized the situation by assuming the title Tsar of All Russias in 1547. 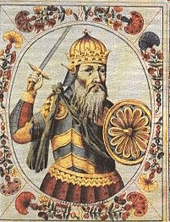 From the rule of Ivan III, the Grand Duchy of Moscow effectively became the dominant Russian state, overthrowing the Golden Horde, consolidating all remaining Russian principalities under itself, and conquering lands far from its roots in the city of Moscow. 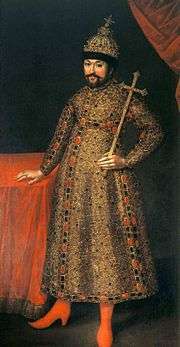 While Ivan III became effective ruler over the entirety of Russia, the situation was not formally recognized until his grandson Ivan the IV assumed the title Tsar in 1547, when the state of Russia (apart from its constituent principalities) came into formal being. Dates are listed in the Old Style, which continued to be used in Russia. 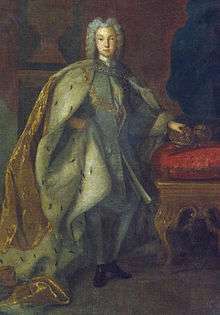 The Time of Troubles came to a close with the election of Michael Romanov as Tsar in 1613. 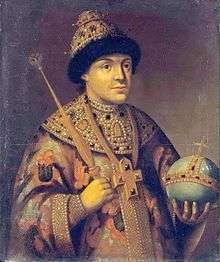 Michael officially reigned as Tsar, though his father, the Patriarch Philaret (died 1633) initially held the real power. 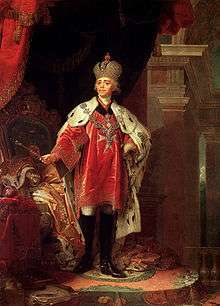 However, Michael's descendents would rule Russia, first as Tsars and later as Emperors, until the Russian Revolution of 1917. 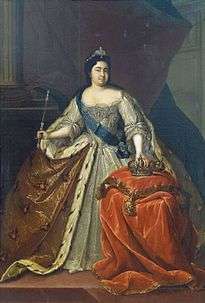 Peter the Great (reigned 1682-1725), a grandson of Michael Romanov, reorganized the Russian state along more Western lines, establishing the Russian Empire in 1721. 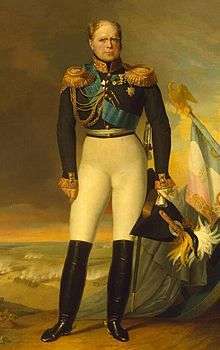 See List of leaders of Russia for the continuation of leadership. Grand Duke George Mikhailovich of Russia, heir apparent and son of Maria Vladimirovna, of the Vladimirovichi branch. ↑ "Russian history: Kievan Rus". Russiapedia. RT. Retrieved November 26, 2013. ↑ Glenn E. Curtis (1996). 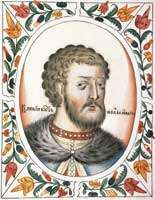 "Kievan Rus' and Mongol Periods". Russia: A Country Study. Federal Research Division of the Library of Congress. Retrieved November 26, 2013.